Snap, Crackle, and Pop! Bright and tasty Rice Krispy Treats topped with Pop Rocks that literally explode in your mouth! The dish I’m taking care of today, is the most important meal of the day: dessert. These Firecracker Krispy Treats are my contribution to this collaboration, and I’ve gotta tell you…they are just plain FUN! In honor of Memorial Day and The 4th of July coming up, I wanted to create a super fun dessert that literally would explode like those giant fireworks you’ll be watching at night. So what else was there to do, but to combine the “Snap, Crackle, Pop!” of Rice Krispies, with that “Explosion!” you taste from a handful of Pop Rocks? I made these treats patriotic, with the red white & blue sprinkles, and the red Pop Rocks , but these would be super fun with other colors too, for other events! (Purple Pop Rocks, with pink and purple sprinkles?? So cute!!). These treats are so simple to make, and you’ll only need 5 ingredients! Feel free to use Gluten Free crispy rice cereal in this recipe, if you’d like; they work and taste exactly the same as regular Rice Krispies do. Keep the krispy treats super soft by slowly melting the marshmallows on the lowest heat setting on the stove; then remove the marshmallows from the heat just slightly before they’re totally melted to gently fold in the cereal and sprinkles. Next, use a greased spatula to smooth the treat mixture into your pan, and resist the urge to pack them down! Packing down the mixture will lead to hard treats, which will make us a little bit sad. Then comes the best part: the Pop Rocks !! Sprinkle them all over the top of the treats, and then just let them cool completely before cutting and devouring!! The treats do take on the flavor of the pop rocks, so be sure and pick a flavor you enjoy! Thanks so much to the other ladies for contributing their delicious dishes, and here’s to a poppin summer!! Snap, Crackle, and Pop! Rice Krispy Treats topped with Pop Rocks that literally explode in your mouth! Place Butter and Marshmallows in a large pot, on the stovetop. On LOW heat, slowly melt together the two ingredients, stirring occasionally. It will take several minutes to melt the marshmallows. Meanwhile, line a 9x13 inch pan with foil, and spray with nonstick cooking spray. Set aside. As soon as the marshmallows are almost completely melted, remove from heat, and gently stir in the Crispy Rice Cereal. Stir in sprinkles. Gently transfer the cereal mixture to the prepared pan, and using a spatula coated with nonstick spray, gently even out the top. Do not pack down. Sprinkle Pop Rocks and additional sprinkles across the top of the treats. Allow the treats to cool fully before cutting into squares (about 2-3 hours). Treats are best (Pop Rocks are most active) when eaten within 1-2 days. Dessert is the most important meal of the day! According to the hubby! These fire cracker bars look amazing! perfect for Memorial Day through Labor Day! Thanks for sharing! YES–Definitely the most important meal! Thanks so much; I hope you love these treats as much as I do!! My kids would LOVE these, Anna! What a fun treat for all of our summer cookouts. Perfect! Pinned and sharing. Thanks so much Blair! 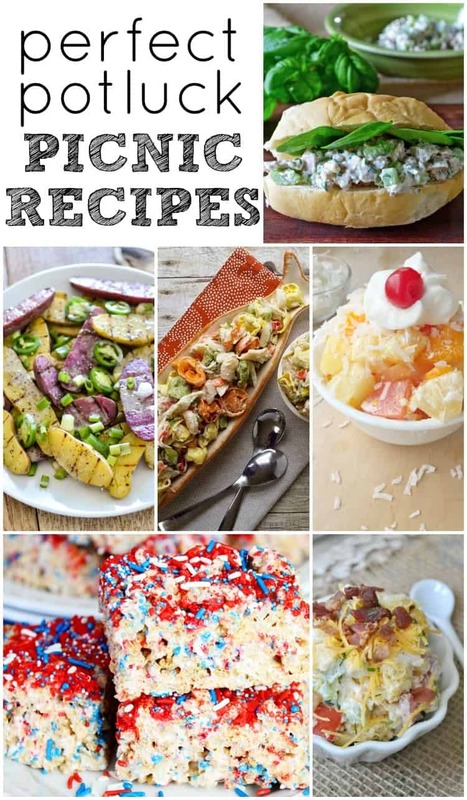 I can’t wait to start cooking up a storm with all these fun recipes from the roundup! Thanks Justine! Ha-pop rocks just somehow have a way of bringing out the 5-year-old in us!